Consider that for a minute while you study the photographs included here of Red Wings on the hunt. Frame in your mind what might happen in today’s NHL in the aftermath of such a scene. When in 2010 the late Rick Rypien grabbed at a fan in Minnesota who’d yelled at him as he was departing the ice, the Vancouver forward was suspended for six games, and his team was fined $25,000. NHL Commissioner called the fan to apologize and offer reparations in the way of dinner and tickets. Czeponis said he wasn’t interested in pursuing legal remedies — all he wanted was an apology. I don’t know whether he got it — his name vanished from the news as quickly as Rypien’s case didn’t. …with 30 seconds of the game remaining, he swung his stick, one-handed, over the boards and rapped rail-viewer Staff Smythe, son of you-know-who, on the shoulder. Lindsay had high-sticked and cut Toronto’s Eric Nesterenko and Smythe, who was GM for Toronto’s Junior A Marlboros, had “yelled anathema against Lindsay and suggested loudly that a penalty would be in order.” Referee Frank Udvari didn’t agree. Linesmen restrained Lindsay and the game continued, but only after Conn Smythe had consulted with NHL Referee-in-chief Carl Voss, who was on hand. “It’s a matter for the league,” Smythe Sr. said afterwards. If the NHL levied a fine on Lindsay, or administered any kind of rebuke, nothing made the news. He and his temper played on. In December, in a game against Chicago, Lindsay’s disagreement with referee Jack Mehlenbacher’s decision to penalize him for tripping Bill Mosienko took the form of the stick he broke banging it on the ice, accented with insults. When Mehlenbacher added a misconduct to his sentence, Lindsay elaborated on the invective, which earned him a game misconduct. Fines for that outburst cost him $75. A rumour adrift around this time was that Lindsay’s discontent had Jack Adams looking to trade him. That, of course, did eventually come true, though not for another three years, Lindsay followed Prystai to Chicago as punishment for his efforts in trying to launch a players’ association. 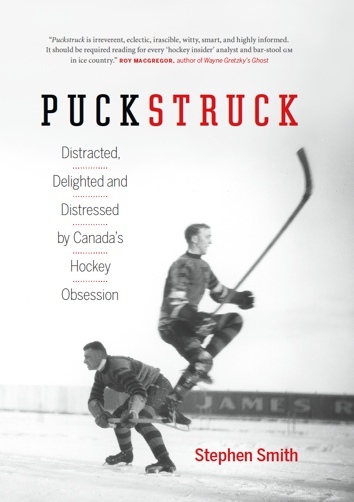 Next, in December of ’54, Lindsay hurt himself: chipped his shoulder trying to split the New York defence, from what I’ve read — or split his shoulder chipping the Rangers? Other reports refer to a “cracked collarbone:” take your pick. 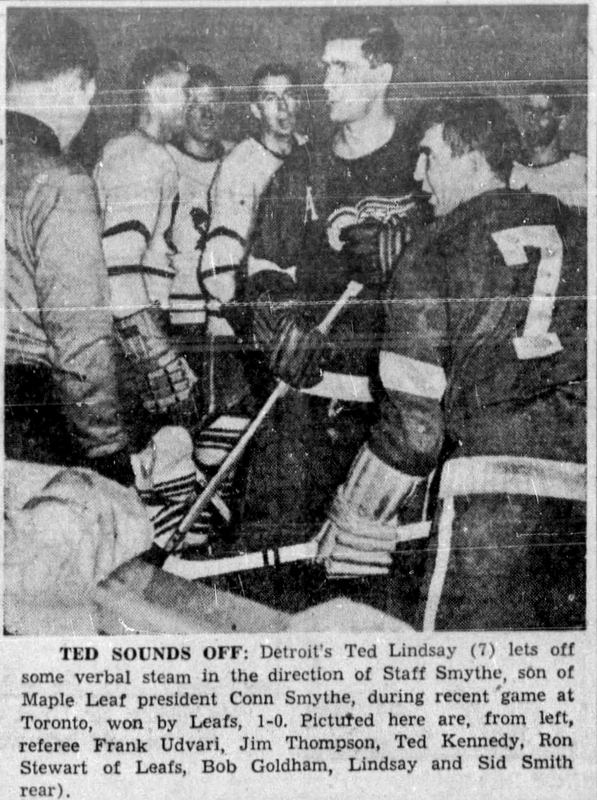 Come January, when Detroit was jockeying in the standings just back of league-leading Montreal, Lindsay slipped (on wild, non-rink) ice while getting out of his car, aggravating his injury, keeping him off the (artificial, hockey) ice another week. At the end of January, six games after his return to the line-up, Lindsay and the Red Wings were back in Toronto for a Saturday-night game at Maple Leaf Gardens. Some of the cast had changed, but the script remained more or less the same. One more time, Lindsay saw the need to take his fight to the fans. 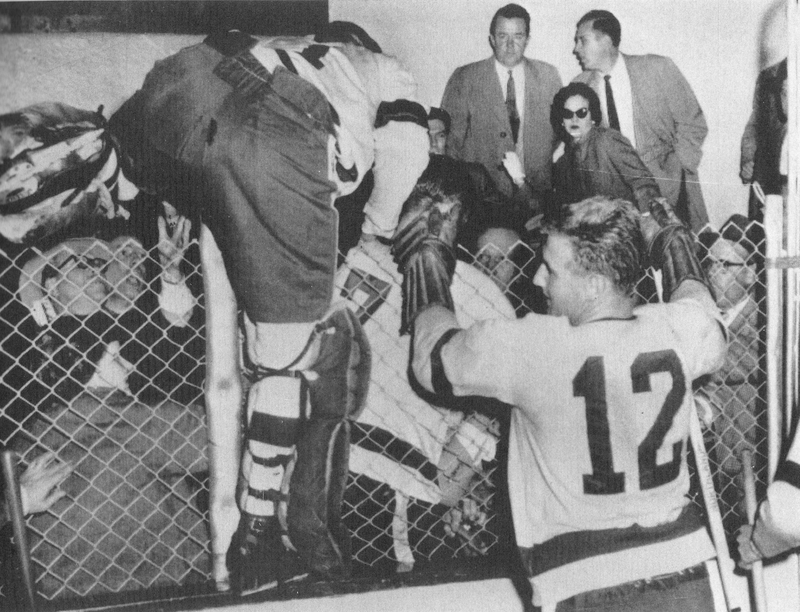 A spectator, Spike Tenney, grabbed Howe’s stick. He said later he did it to protect his son, sitting beside him, from possible injury. Howe tore his stick loose and, as he skated away, Tenney allegedly threw a wild punch that fractured only the air. Then, terrible-tempered Ted enhanced his reputation as a super-villain in our town. He raced across the ice, stick held high, and attacked Tenney by flailing at him with a gloved fist. Tenney struck back. Several blows were thrown. Tenney claimed he was struck, around the eye. Although blow-by-blow reports from the scene were somewhat confusing, observers claimed Tenney connected once to Tenney’s face. A law laddie restrained the spectator. A linesman grabbed Lindsay. Referee Red Storey imposed no penalty. Tenney retained his seat. Referee-in-chief Carl Voss was, again, on hand, and was seen making copious notes and talking with Tenney. The situation, this time, concerned the league office in specific terms, apparently. Attending a parley in Montreal that Clarence Campbell called were referee Red Storey and linesmen George Hayes and Bill Morrison; their boss, Carl Voss; Lindsay and Howe; Adams and Detroit coach Jimmy Skinner; and the team’s PR man, Fred Huber, Jr. The Red Wings declared themselves shocked. Bruce Norris promised to appeal the sentence. They were quick to toss up a Maurice-Richard-shaped what-about: when at the end of December the Montreal star slapped linesman Hayes, Campbell had only imposed a fine. “Actually,” a Detroit spokesman noted, “Campbell praised Richard for his fiery competitive spirit as an aftermath of that brawl with the linesman.” Jack Adams saw it as another attempt to harass the Stanley Cup champions, throw them off their game. The NHL’s board of governors gathered in New York to consider Detroit’s appeal. Conn Smythe interrupted a Florida vacation to attend; also on hand were Norrises Bruce and Marguerite from Detroit, and Jim, representing Chicago; Boston’s Walter Brown; Frank Selke from Montreal; New York’s General John Reed Kilpatrick. There was speculation that if the assembled panjandrums ruled to rescind the suspension, their president would resign. Asked about this after the decision was upheld, Campbell didn’t deny that he’d been planning an exit. None of this (usually) rates a mention when the talk turns to the events of March of 1955, as it tends to do when the anniversary comes around. It’s 64 ago today, St. Patrick’s Day, that Montreal boiled up and over, burned and was broken, in what’s remembered as the Richard Riot. It was the final week of the NHL’s regular season and, as they had been all season, Detroit and Montreal were vying for first place in the standings. 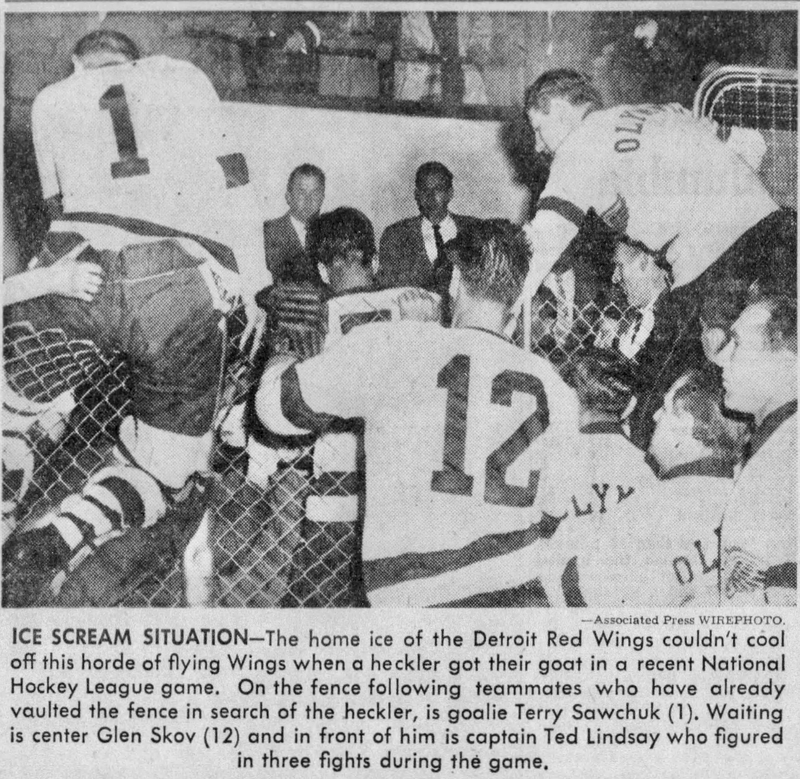 Ted Lindsay was back from his suspension, and the Wings were on a tear going into the final stretch, unbeaten in seven straight and just two points behind the first-place Canadiens. Before the season ended, the two teams would meet in a home-and-home series. Just ahead of that, though, Montreal played in Boston. That’s where Richard and Boston’s Hal Laycoe got to swinging their sticks at one another, inciting a general ruckus in which Richard punched another linesman, Cliff Thompson, and knocked him out. What happened next is well documented, and will be again this weekend. When the tear-gas had dissipated, once the shattered glass had been swept off Montreal’s Ste. Catherine Street, Richard sat out his suspension as the playoffs went ahead without him. Montreal and Detroit met in the Finals in April, with the Red Wings prevailing in seven games. 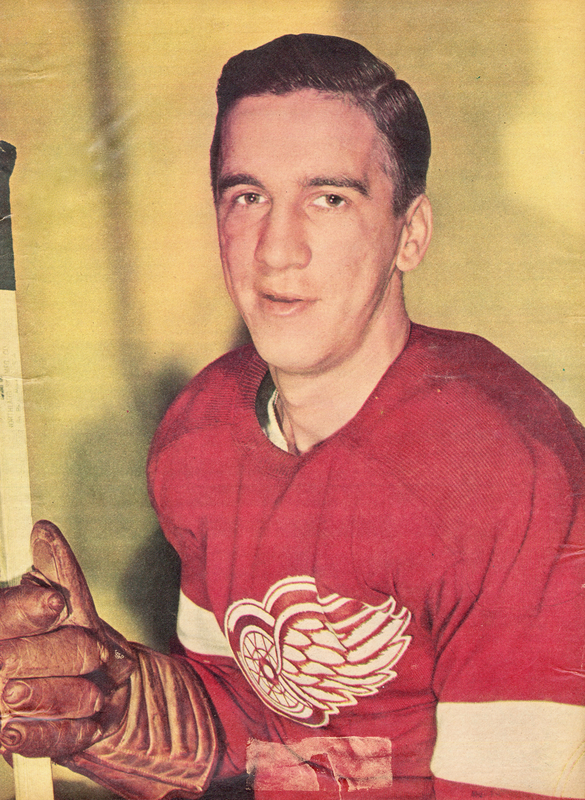 Ted Lindsay was at the fore for the victors, of course. The series went to seven games. Lindsay was, instrumental in his team’s triumph. His 12 playoff assists led the NHL, and with 19 points, he finished one back of Gordie Howe in post-season scoring. The four goals he scored in the second game set a Finals record. I don’t know what all this adds it up to. It’s impossible to say just how much Lindsay’s three attacks on spectators and the debate over his suspension weighed on Clarence Campbell when he came to consider Richard’s case. Critics (many of them in Detroit) accused the NHL president of letting Richard off lightly for attacking a linesman in December. When he did it again in March, did that have anything to do with what seemed like an over-reaction by Campbell? Lindsay sat out four games for a third offence; banned for his Boston uprising for the remainder of the regular-season and all of the playoffs, Richard missed 15 games. If Richard’s suspension was unduly harsh, how much did that have to do with the market for bad behaviour that Lindsay had helped create earlier in the season? There are no good answers to these questions, of course — as Campbell might have chimed in if they’d been posed to him, there’s no real coming to grips with hypothetical cases. One more point might be worth making here, though maybe not. Here it is nonetheless: Ted Lindsay and his several surges past the edge of the rink and into the real world coalesce, for me, into a handy portable exhibit of the NHL’s astonishing sense of its own exceptionalism. This was nothing new in 1954-55, and would continue to be nothing new for years — decades, even — after that tumultuous season. Still, it’s instructive that three times that year a hockey player struck at civilians, twice without any kind of consequence. I’m not pointing a finger particularly at Lindsay here — he wasn’t the only one to be assaulting and battering fans in those years. There’s a whole alternate history of hockey’s misrule to be written, and part of that will dissect just how much the game’s cultural standing, particularly in Canada, has contributed to and upheld the NHL’s argument that the regular rules governing orderly conduct and not punching people repeatedly in the head don’t apply once you put on skates and take to NHL ice. There’s a good dose of arrogance in the formula, too, and tincture of fear of change, some essence of self-preservation. Mixed up altogether it has created a brew that induces the magical thinking that has enchanted the NHL for years, in the thrall of which the league has granted itself the permission not to confront (let alone curb) fighting, and to continue to dissemble and deny when it comes to the damages that concussions do, and the grim realities of CTE. For a long time our wider civil society has accepted, or at least not really challenged, the NHL’s story on all this. That’s slowly coming to an end. I think it is — isn’t it? That’s a bit of rant, I guess, but it’s over. I should add, and will now, that Lindsay had one more conspicuous contact with a spectator that ’54-55 season. I’ve extracted it from the chronology and kept it for last: that seemed like the right thing, structurally. “This is a new twist to the man-bites-dog and horse-stops-runaway-man routine,” The Boston Globe’s Harold Kaese teased in a front-page column before coming out in favour of protecting players. As Lindsay later told it, he had no intention of pressing charges until the Boston police came to see him after the game and encouraged him to do so. Plus, as he saw it, he was only protecting his own interests. James Mulloy, 24, was the fan charged with assault and battery; Officers George Doyle and Wilfred Guilbuilt did the arresting. He was released on $50 bail and the case was put over until Lindsay could return to testify, though it was later decided that wasn’t necessary.